Bollywood never ceases to overwhelm us when it comes to romance. 90s Bollywood blockbuster films are the best examples of this. Despite being a period of Bollywood blockbusters, 90s films are a cringe fest. There was a time when we were super excited about these films. But now when we watch these, we really start doubting our own choices. They make us contemplate as to why the director didn’t catch such dumb mistakes. How come these movies became blockbusters? Hum Sath Sath Hain was a super hit film of 1999. The film is quite sweet and nice. This is quite a favorite film of all but there are some things which are really cringe-worthy if we see it carefully. The funniest part of the film is when Tabu takes all her family members at the honeymoon. Who does that? Imagine a honeymoon with Bhai Bhabhi or Chacha Chachi. Is it a honeymoon or a family trip? The film is too much sweetened with family love without any spice. The best part of the whole film was the three friends of Reema Lagoo since they added up some spice to the story. This iconic film is a super duper hit of 1995. Everybody knows that DDLJ is the most romantic film of Bollywood. This love saga too unveils many flaws which you must have definitely not noticed. Have you wondered how come Raj ( Shahrukh Khan) came to know about the venue of Simran’s (Kajol) wedding? Was there google map installed in his mind? How come Raj boarded the train from a station named ‘Apta’ which is near Mumbai when the wedding was supposed to happen in the outer parts of Punjab. “Aise bade bade shehro mei jagah bhul jaane ka dar toh rehta hi hai na senorita” 😛 Please don’t risk your life like Simran where she runs to catch the hold of Raj’s hand in the last scene and doesn’t climb into the compartment right next to her. Quite dumb, right? This love saga was a blockbuster film of 1998. Despite being a blockbuster, the film unveils some stupid mistakes that are hilarious. Tina (Rani Mukerji), after studying at Oxford University comes to St. Xavier’s college for further studies in India. It’s like going from 5-star to nukkad! Tina gave Anjali (Tina’s daughter) 8 letters to be read till her eighth birthday so that she could unite Anjali (Kajol) and Rahul (Shahrukh Khan) later on. Maybe, Tina didn’t know that a child of one or two years of age doesn’t know how to read. Another mistake was when Anjali and Rahul participated in the inter-college competition and got bombarded with tomatoes. After few seconds, Tina arrives on the stage to cover up their mistake and magically the whole stage gets cleared off with tomatoes. I guess the stage was hungry and gulped all the tomatoes! 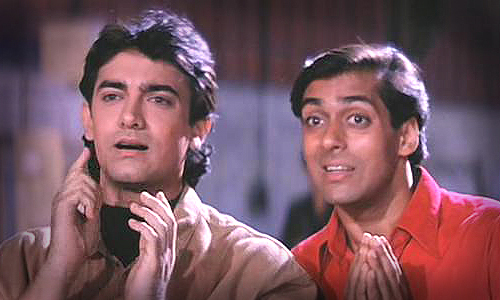 Andaz Apna Apna was a hit film of 1994. This great film was one of the Bollywood blockbusters and is one of my personal favorites with a big flaw. Have you noticed Salman Khan’s hair in the film? Well, if you haven’t, see it now. Wonder how the director managed to uncover such huge mistake in the film. Ohhh! 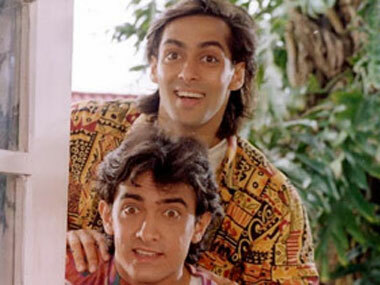 Is this the reason the film was named Andaz Apna Apna? Was this Salman Khan’s andaaz? Bhai style! Judwaa was a smashing hit of 1997. As we see it today, some illogical scenes of this film really annoy us. The film includes a scene where the judwaa brothers faced problems together wherever they were. When one brother got hit, another one automatically started to feel the pain on the body part at which the first brother was hit. And when the first brother started hitting the hooligans another one too would indulge in a fight in the same manner as the first brother would. This is hilarious! No matter how much these Bollywood blockbusters are praised by the viewers, with the changing times, they still annoy us in some way or the other.